This set has every size you need for mixing and serving. They nest compactly for easy storage. These 6.5 oz. bowls are perfect for condiments, sauces, and prep bowls. I love the lids for fridge storage. I used this handy tool to grate the ginger in this recipe. It's also handy for zesting citrus, grating hard cheeses, and mincing garlic. This handy tool makes it easy to thinly slice the red onions for this recipe. This is a crisp, refreshing salad that is great paired with grilled chicken or fish for a healthy, low cal meal. --Wash snow peas, trim and remove strings if necessary. Place in microwave proof bowl with cover. Half fill a large bowl with ice cubes and water, leaving enough room to add snow peas later. Microwave peas 2 to 2-1/2 minutes until slightly cooked but still crisp. (The water on the peas from washing them is enough to create steam in the microwave.) 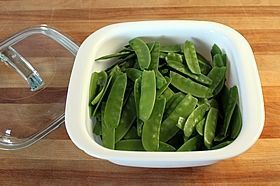 Immediately immerse cooked snow peas in bowl of ice water so they stop cooking and chill completely. --Peel and section orange and grapefruit, removing all pith and membrane. 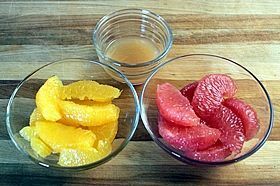 Put citrus sections in a separate bowl, saving any juice in another small bowl. Squeeze the membranes to remove any remaining juice; add to juice in small bowl. --In large bowl, whisk together 3 tablespoons of reserved citrus juice, vinegar, honey, salt, pepper, and ginger. Continue whisking briskly while adding oils in a thin stream. 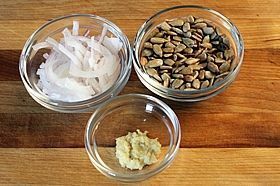 Add drained snow peas, onions, and sunflower seeds to bowl and toss thoroughly with dressing. Add grapefruit and oranges; gently toss and serve. 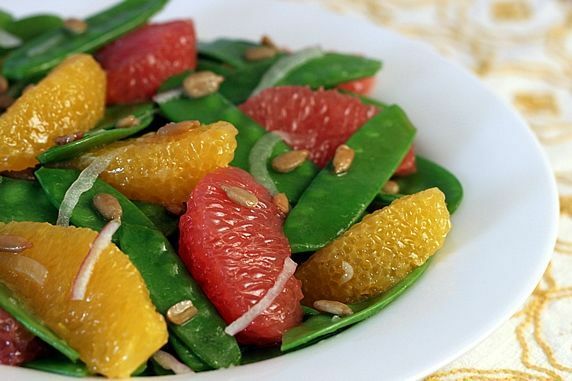 Even if you're a grapefruit hater (I know they're out there), you have to admit that this salad is beautiful. How can you not love looking at that colorful bowl of goodness? It looks like a bowl of sunshine. 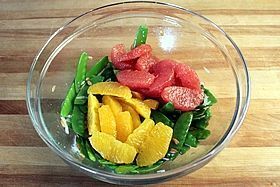 I had a delicious salad at a restaurant a few years back that had snow peas, citrus, and sun flower seeds. That's all I remember about it--and that it was refreshing and good. This recipe is my attempt to replicate that restaurant salad. It's become a favorite for King-Man and me. If you don't like grapefruit, you can omit the grapefruit and double the oranges in this recipe. If you don't like oranges, well, this sadly just isn't the recipe for you. Me? I love grapefruit. I actually kind of crave it, especially this time of year. Fortunately, it is insanely good for me. (I crave hot fudge sauce, too. It's unfortunately not insanely good for me.) Not only does this yummy salad combine tart & sweet with a crunchy texture, it is also packed with nutrition. Read on. Oranges are also loaded with vitamin C. In fact, one Orange contains 89% of daily Vitamin C requirements. They also contain Vitamin A, iron, and calcium. Oranges have cancer-fighting and heart protecting properties, too. 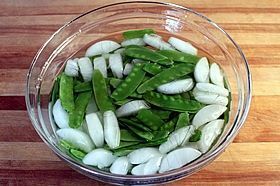 Snow peas are high in fiber, protein, Vitamins A, C, K, B complex. They have nutrients that promote bone and heart health and help reduce fatigue and boost energy. Sunflower seeds have high levels of Vitamin E--the body's primary antioxidant. They have nutrients that reduce inflamation, symptoms of asthma and arthritis, and the risk of colon cancer. You will be feeling all kinds of healthy if you make this salad. 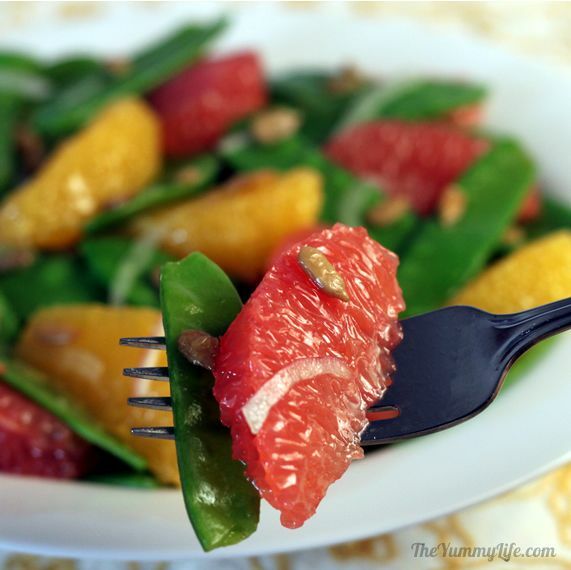 Snow Pea, Grapefruit, and Orange Salad. Step 1. Assemble the ingredients. 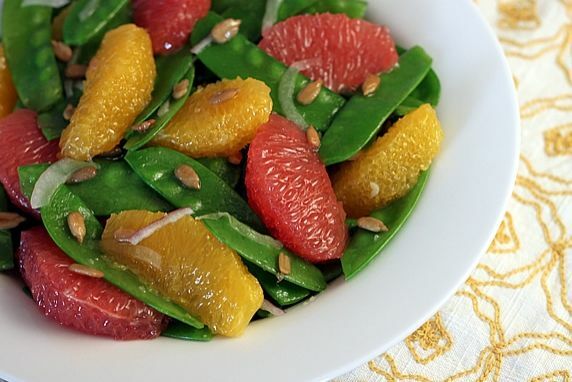 Snow peas, orange, grapefruit, red onion, white wine vinegar, honey, kosher salt, white pepper, ginger, olive oil, vegetable oil, sunflower seeds. Step 2. 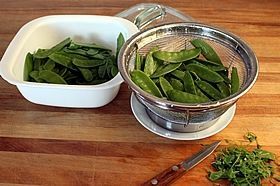 Wash the snow peas and remove the strings, if necessary (some come stringless now). Put them in a microwave safe, covered dish. Step 3. 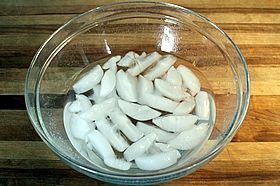 Half fill a large bowl with ice cubes and water. Step 4. Microwave peas for approx. 2 minutes until slightly cooked but still crisp. The water on the peas from washing them is enough to create steam while they cook. You can also blanch them in boiling water on top of the stove. But the microwave is easier. Step 5. Immediately immerse the cooked snow peas into the bowl of ice water so they stop cooking and chill completely. This keeps them crisp. Step 6. Slice the red onion. Make it paper thin. I use a mandoline. Then roughly chop the slices into 1" pieces. Step 7. Grate or mince the ginger. I use a microplane for this. How to Peel and Section Grapefruit and Oranges. 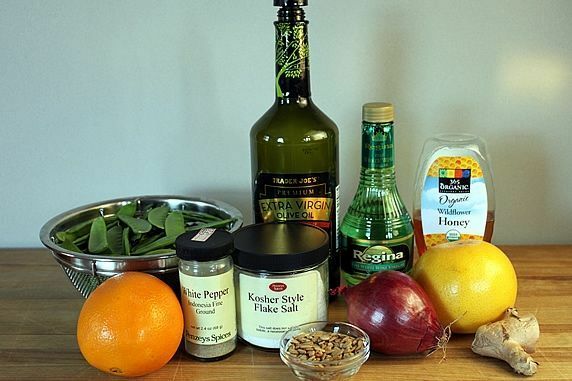 Save the juice from the citrus; you will need 3 tablespoons for the dressing. I use a combination of the orange and grapefruit juice. Step 9. 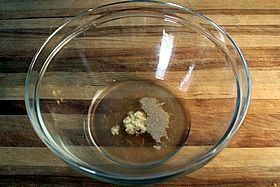 Make the salad dressing in a large bowl. 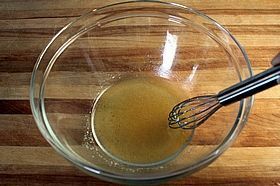 Add the citrus juice, vinegar, honey, salt, white pepper, and ginger to the bowl and whisk it until it's well combined. While whisking briskly, add the oils in a thin stream. Step 10. 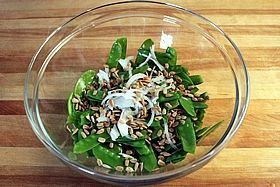 Add the drained snow peas, onion, and sunflower seeds to the bowl and toss it all together. Toss it well so every piece is well coated with the dressing. Step 11. Add the orange and grapefruit and toss gently. Don't over mix--they're fragile and will break apart if you're not careful. Serve immediately. 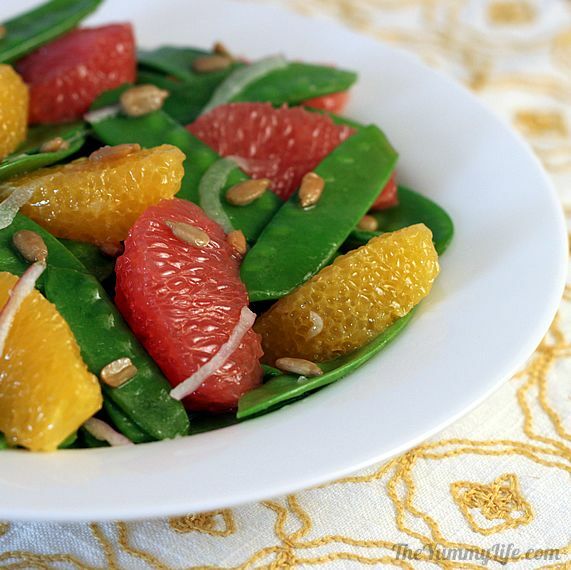 Make Ahead Tip: If you're not serving the salad right away, don't add the citrus to the salad. If the citrus sits in the dressing too long, it will start breaking down and get mushy. 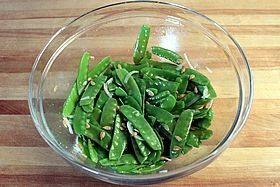 Cover the dressed snow pea mixture and put it in the fridge for up to 4 hours. 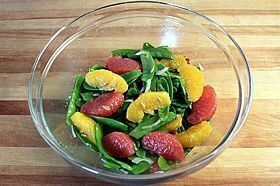 Refrigerate the citrus in a separate bowl, and toss it into the salad right before serving. Time to eat! This salad is good by itself for lunch or paired with grilled chicken or fish for a low calorie, low carb dinner. Dig in and enjoy a healthy, tasty bite.